2013: One Hell of a Year for Burning Books! 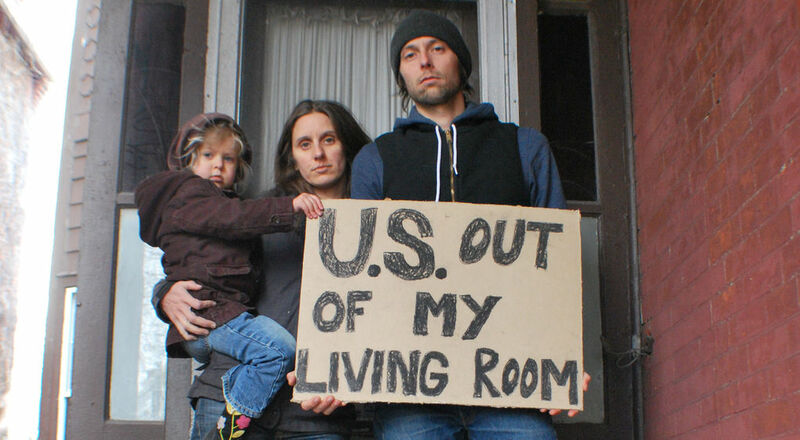 Home › News › 2013: One Hell of a Year for Burning Books! We started 2013 off right with the acquittal of Burning Books owner Nate Buckley for criminal charges stemming from a war and bailout protest back in April of 2011 where he was tackled, clubbed and sprayed directly in the face with mace by NFTA transit police. This victory was a long time coming, and could not have happened without the great efforts by Nate’s legal team and much hearty community support! In January we had an excellent presentation by Dylan Powell of Marineland Animal Defense, along with screenings of The Secret File on J. Edgar Hoover, Josh Fox’s short film The Sky is Pink on hydrofracking, and Pickaxe, which documented the inspirational Warner Creek tree sit and blockade in Oregon in the 1990s. February was the Revolution Before it’s Too Late lecture by former political prisoner from the SHAC 7, Josh Harper (who has since “retired” from giving public presentations). We also screened Dear Governor Cuomo about fracking in New York State, and screened the rare film, Through the Wire, highlighting the plight of three female political prisoners held in a secret subterranean prison in Lexington, Kentucky during the 1980s. In March, we screened William Kunstler: Disturbing the Universe, covering the life of the iconic and prolific movement attorney and held a legal defense fundraiser for Nate Buckley at Nietzsche’s with Occupy Buffalo. We also tabled all the way across the country at the prestigious Bay Area Anarchist Book Fair and across the state at Wells College’s annual activist symposium. April was a very busy month for Burning Books. We held a screening of Freeing Silvia Baraldini with the filmmakers, as well as Bidder 70, along with a live video presentation with subject Tim DeChristopher. We hosted talks by Rachel Wolkenstein, attorney for political prisoner Mumia Abu Jamal, and Scott Crow, founder of the Common Ground Collective providing relief for Hurricane Katrina and a main target of FBI informant Brandon Darby. We also tabled at the Buffalo Small Press Book Fair and held a Memorial Tribute to Dacajeweiah, “Splitting-the-Sky,” Attica Brother and American Indian activist who passed on and who was our very first presenter at the opening of Burning Books back on the 40th anniversary of the Attica Prison uprising. April was also the month that we launched our resistance to the federal surveillance we discovered back in September of 2012. An article in Artvoice outlined the situation and announced our fundraiser at which hundreds of people showed their support by filling the First Amendment Club. In May we proudly hosted notorious activist and author, Ward Churchill, and we screened the rare documentary Brave Hearted Woman about martyred American Indian Movement activist Anna Mae Aquash as well as the documentary on the dangers associated with the genetic modification of our food, Genetic Roulette. We also co-sponsored Buffalo’s first annual Day of Action Against Incarcerating Youth, and on May 1st, the Buffalo News featured a front page story on the federal surveillance we’ve been subjected to. June 11th is the annual day of solidarity with Earth liberation prisoners and this year we hosted an event focusing on Eric McDavid and Marie Mason. We screened Stonewall, a documentary on the watershed event for the gay rights movement, and screened The Camden 28 about Catholic left Vietnam War draft raiders and featured a talk by former defendant in the case, Bob Good. Believe it or not, June was also the month we (along with the Prison Abolition Reading Group) featured presentations by Vikki Law, on women in prison and the relationship between families and freedom struggles, as well as the Green is the New Red presentation by activist and journalist Will Potter, outlining “how fear of ‘terrorism’ is being exploited to push a political and corporate agenda.” Also in June, the Buffalo News featured a follow-up story on the federal surveillance that we’re under and we tabled at both the Allen West Festival and Pete Seeger’s Clearwater Revival along the Hudson River. In July, we had a talk by Bruce Beyer on the Buffalo 9 and his story of Vietnam War draft resistance, a Sustainable Cycles presentation on menstruation by bicyclist Rachel Horn, and a presentation on organizers of the support campaign for federal grand jury resister, Jerry Koch. On the 4th of July, a story covering the Postal surveillance of Leslie James Pickering and Burning Books was featured on the front page of the New York Times. A week later, a story also aired on NBC Nightly News. In August, we screened Home of the Brave detailing the case of murdered civil rights worker Viola Liuzzo in 1965. Burning Books was also featured on a public access program hosted by attorney Michael Kuzma and tabled at the Denver ABCF annual gathering. September was the 2nd birthday of Burning Books and to celebrate we hosted surviving Attica Brother, Richard X Clark and former Attica Brother Legal Defense attorney Danny Meyers. We also held a talk by author Peter Gelderloos on The Failure of Nonviolence from Arab Spring to Occupy, and screened Passin’ it On covering the Black Panther Party and the Black Liberation Army. In October, we brought in Ramona Africa for a presentation on the MOVE organization and political prisoner Mumia Abu Jamal, as well as author Waldo E. Martin Jr. to talk about his book, Black Against Empire: The History and Politics of the Black Panther Party. In addition, we screened Free Angela and All Political Prisoners, focusing on the 1970s case against Angela Davis, and co-sponsored a birthday celebration for political prisoner Jalil Muntaqim at El Buen Amigo. November was when we brought in Kristian Williams from Portland, the author of multiple books dealing with aspects of state repression, as well as host of Let’s Talk Native, John Kane. It was also the month we screened Eyes of the Rainbow as part of National Assata Shakur Liberation Day, The Spirit of Anna Mae along with a Buffalo Prison Abolition Reading Group potluck, and The Central Park Five about the heinous case of five black and Latino children who served many years in prison for a crime they did not commit. We also tabled at the 25th annual WNY Peace Center Dinner in November. This December, we are hosting our annual Winter Open House, where there is food and good cheer for all and everything in store is on sale – it’s a great time to do some holiday shopping! We’re also screening Mumia: Long Distance Revolutionary, a new documentary highlighting the case of political prisoner Mumia Abu-Jamal. In short, during 2013, we hosted over 17 presentations, screened well over 20 films, were featured prominently in the local and national media, successfully resisted a criminal persecution and have launched a FOIA lawsuit against a number of federal agencies for spying on us… as well as hosting numerous other community events that were not mentioned above. 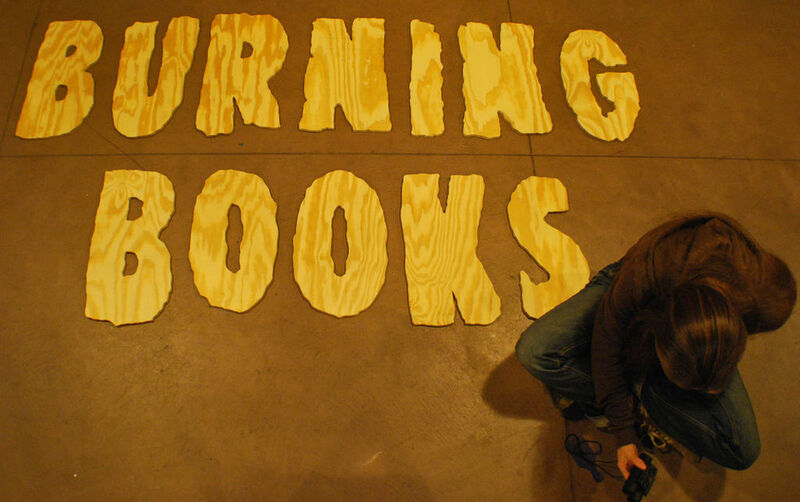 Support Burning Books as we Take On 2014! With your support, come January 2014, we’ll start all over again with a year of amazing presentations, eye-opening films and crucial community events. Hopefully this monthly breakdown illustrates just how much significant work is getting accomplished through Burning Books and emphasizes what an important resource it is to the struggle, and for our community. We could not do any of this without your continued support. All of you have helped spread the word about good things going on at Burning Books. Many of you have given generously while the basket is being passed at our events. A lot of you have held your own events at Burning Books. A number of you have supported our fundraising efforts to bring specific speakers and events to Burning Books, either online or in person. And a few of you have even set up regular, ongoing donations from your bank to enable all this to happen. We want to thank you all, from the bottom of our hearts. Together we will continue to push the struggle forward into 2014! ~ Make a donation of your choosing to Burning Books online. ~ Contact us at orders@burningbooksbuffalo.com to set up a recurring donation to Burning Books from your bank. ~ Do your holiday shopping at Burning Books and stop in to make a year-end donation in person.